This year’s Town Meeting in Rye Community Centre passed pretty peacefully given that is election year for both the Town Council and Rother District Council. But, given the possibility that Brexit might lead to a sudden general election, Labour’s prospective parliamentary candidate for the constituency Peter Chowney, leader of Hastings Council, was also present. Though sitting MP Amber Rudd was not. Up on the platform the mayor was joined by our Rother district councillors and East Sussex County Council leader Keith Glazier, but they did not have to answer many questions. 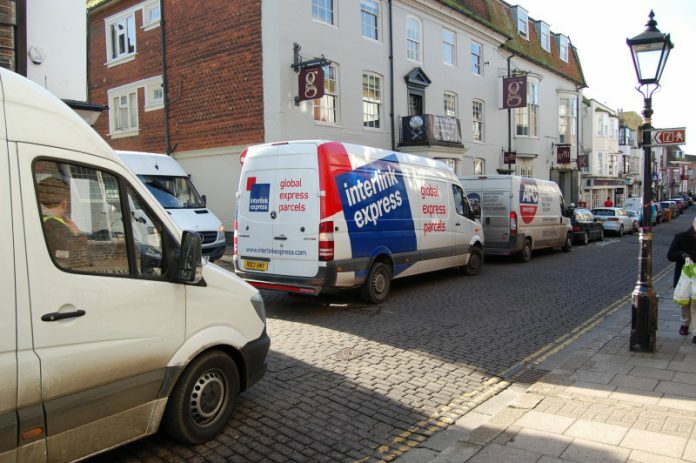 The introduction of traffic wardens (finally) was neatly blamed by Rother’s Lord Ampthill on the police for walking away from most traffic issues, but the surprise “row” – if you can call it that – was not about parking (though it got a mention) or traffic problems (see photo above) , but about the state of our pavements. Town councillor Ian Potter had personal experience of the problem as he currently has very severe back problems and has needed to walk with the help of a frame – which has proved difficult. But more of that in next week’s Rye News. This week we only had enough time to include some highlights of Wednesday night’s two hour meeting and more reports will appear next week. And Anthony Kimber, who was rightly praised for all his work on Rye’s neighbourhood plan at the meeting, commented that John Howlett (whose death is reported elsewhere in this issue) contributed significantly to putting together parts of the plan – and John will be missed because he actively contributed to the community – as well as complaining (loudly). I was surprised to see on studying my Council Tax Bill they the Rye Precept and Special Charges have risen by 16.1% This seems way over the top and I would suggest that an explanation is given before the elections take place. In combination these charges exceed those of the Fire Service and are 64% of what we pay for policing. I am surprised that this matter has not been raised by Rye News and that it was not mentioned at the Town Meeting The largest other increase was 14.5% for Sussex Police but that had been preceded by a Consultation. Is this related to that large debt taken on in relationship to the Council’s property initiative? Please explain as I would assume that there is good justification.